The dentists at Meadows Dental Group are dedicated to achieving a successful outcome for every patient. Our dentists have consistently been included in Top Dentists lists released by 5280 magazine, and we also have a team of experienced dental hygienists and an in-house root canal specialist. As a result of our skill, experience and the long-term relationships we form with our patients, Meadows Dental Group is confident in our ability to deliver optimal results for your smile and your oral health. Read about our treatment options below, or call 303-790-2323 today to schedule an appointment at our office in Lone Tree, Colorado. Our dentists and friendly staff welcome patients in and around Highlands Ranch, Centennial and nearby Colorado communities. For patients who want to take the way their smile looks to the next level, we are pleased to offer high-quality cosmetic dentistry. Dental insurance does not prioritize aesthetics, which is why patients go out-of-network to find options to improve the way they look and feel. Experience and reliability count for a lot in cosmetic dentistry. Meadows Dental Group is proud to partner with a local lab that consistently delivers high-quality veneers, crowns and other restorations for our patients. 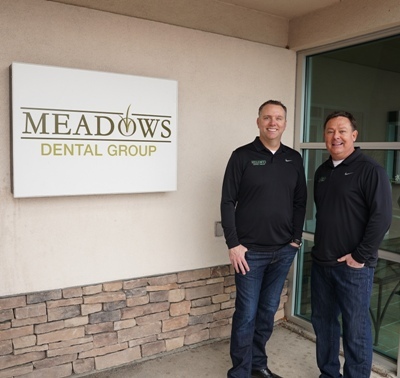 Meadows Dental Group has served the Lone Tree area for nearly 20 years. We always welcome new patients, but we are very proud of the longtime relationships we have built with individuals and families who have been coming to our office for years or even decades. We are pleased to welcome children as young as 3 to our office. We know how important a good first visit to the dentist is for a child’s lifetime health, and our entire team is dedicated to putting parents and kids at ease. Patients young and old might feel nervous when they visit the dentist. In addition to a relaxing office, Meadows Dental Group is also an experienced provider of multiple sedation dentistry solutions. With options including laughing gas, oral conscious sedation and IV sedation, our dentists will help you find a means of controlling your anxiety so you can enjoy a stress-free and beneficial appointment. Dr. Scott Peppler has certifications in traditional braces, ClearCorrect and the Fastbraces system. He is also an Invisalign Preferred Provider. In addition to finding the best treatment, our dentists believe that patients deserve options to make the treatment affordable. Meadows Dental Group offers multiple discounts and financing through CareCredit, and we are pleased to provide you with assistance in applying for financing. Call 303-790-2323 for an appointment with Meadows Dental Group. Patients seeking treatment for one tooth or one area of the mouth may be eligible for a free X-ray and consultation. For those with more extensive needs, standard fees for an examination will apply. Find out if you are eligible for a free consultation.